If you have a toe that is permanently bent downwards your might have Hammertoe. Find out more about this condition and treatments that can help. A hammer toe is not a mini hammer used to hit toes with, hahaha! Well what are hammer toes then? 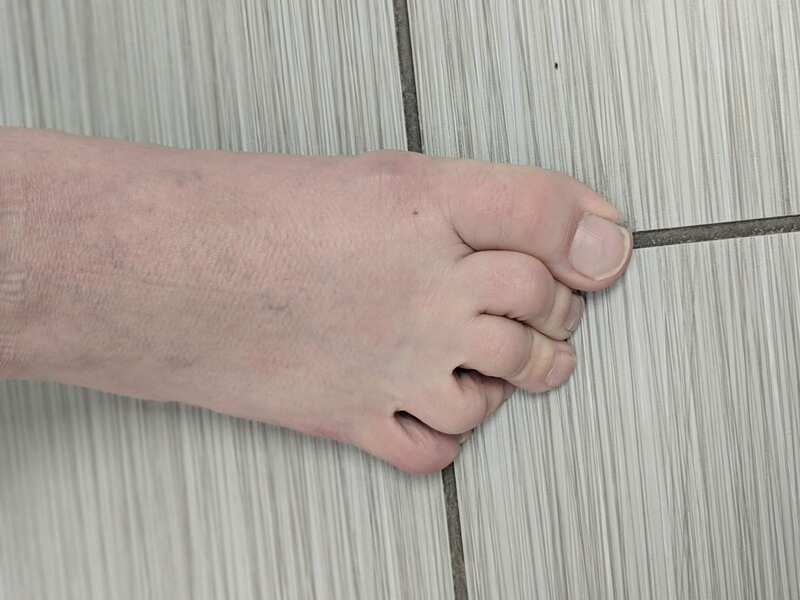 A Hammertoe is actually seen most often in the 2nd toe where that toe is sitting in a crooked position and sticks up compared to the normal toes. You will most often see a hammer toe next to a bunion. When you have a hammer toe, you will find it hard to find comfortable shoes as many shoes will rub or press on the top of that toe. Pressure and friction may lead to blisters, calluses and corns on top of that toe or on the tip of the toe. Improperly fitting shoes and poor foot structure such as flat feet. Poorly-fitting shoes can hold the toes in an abnormal position and result in tightening of the muscles required to maintain that position. In particular, shoes that have high heels and are narrow at front tend to push the toes into an abnormal, bent position.